History is probably a suitable starting point for discussing this new work of Gianmaria Ferrante because the history of man is the history of the cities from agglomerations of piles to the medieval villages and on to the modern metropolises. The game of poetic mimesis turns very often around the amusing contrast of the results of the most modern things around us in the cement of our urban spaces and the universal miseries of a humanity on the decline. Ferrante has already confronted, in some of his most recent collections, the theme of the city but it’s not a coincidence that The White City and Mediterranea, even in the contrasting of problematic considerations and in the strong presence of withdrawn and Orphic figures, let you notice as a filigree references to a harmony in lines typical of classical civilizations – a world that is completed, successful and precise. These works have abandoned, quite rightly, the heroes and warriors illuminated by strong sunlight, adorned with the resplendent glitter of arms and armour. The background landscape was clear, with white-washed walls hit by the Mediterranean winds of sea and town: epic calls to a perennial myth. In Metropolis the historical reference is without doubt the Middle Ages as a storehouse of the results of humanity in decline, living a regression which will probably last centuries like the last just passed. The reference from the beginning to pestilence is a sign of this new medieval period which can be measured in many of the attitudes assumed by present mankind, together with the ostentatious and disquieting presence of sceneries and objects which can easily be seen to correspond to other effects of medieval origin. All this is even more striking considering that the emergence of lines of urban development and in human figures of the contemporary metropolis allow us to substitute, without too great a forcing, the concept of the medieval village. The reader is struck on numerous occasions in Ferrante’s lyrics by vividly graphic images which are insistently used to show horrendous photographic details, thus underlining instances of the horror seen in bits, splinters and flashes, as in the very relevant macabre dance of ‘A Hundred Faces’. The novelty of the “city monk” clarifies, where there is need to, the splendour of the theme confronted and, it must be said, followed and respected with an admirable diligence not common in the activities of today’s poets. Not a single one of the poems in this collection could, in my opinion, comfortably fit into other collections. The parallel between the medieval properly defined and the medieval of the modern metropolis can be seen also in the mingling of the manifestations of ancient peoples and those of today in a play that is intentionally allusive and dreamy, made of overlappings, of fade-in and fade-outs that intersect in the natural representation of images of the medieval urban centre and the precise definition of its present characteristic. Visions of factories blackened by smoke and suburbs, syringes, drug-addicts and drug sellers are the material in the forefront of an investigation that to define as ‘lyric’ could, in fact, result in demeaning it. In effect there is only the gaze of the poet that is perfectly personal, but there isn’t a single verse in which the gaze doesn’t result in an immediate recognition by the reader of those atmospheres evoked of the part we play in each one of our daily horizons and thus an idea that is generally shared, a people’s common feelings, as in the stories of the bards or rhapsodies which speak of their world to others of their same, shared world. And they didn’t speak of themselves. Often the components are completed with the unexpected and unusual movements of figures, chiefly animals or persons (but in some cases the delineating borders are, to say the least, weak) that jump up as if from some sudden outburst. A precarious equilibrium of the unconscious emerges that materialises visions, reproducing them in the emotional magma whose pressure is gained from the concentration of the conditions of metropolitan life. Particularly to be noted is the recurrent image of the pigeon crushed against the asphalt which is equal in force to that of an illuminated poster hording or a town hall notice – so much is the citizen used to seeing them. But conversely, following on with the game of historical-temporal superimpositions, the daily vision of death to which the citizens of a thousand years ago were particularly sensible, not to say habituated, is also a valid consideration. However, Ferrante goes further and he does so using the very sharp blade of the perfect observer. It’s not sufficient to compare one metropolis to the medieval village thinking we can make reference only to external events, the nagging thoughts of a historian and the delights of a curious humanist who looks at the surface of things to finish his neat little essay. Ferrante throws us with the scientific will of a poet (I’m thinking of Jacapone da Todi) into a sheer plummet of dejection when he shows us that we are all basically medieval in the reference to the disturbing and pitiless description of the mid-day lunch break of the service industry employee in a de-personalized self-service restaurant where “machine men” of the third millennium enter in history with the same dose of dignity with which a throng of beggars was sent off to the big business of the Crusades. And what can we say about those “phoney / lumberjack / boots”, used to describe young people dressed in the latest fashion: the emblem of what we have been forced to see in our streets for some thirty years now, mania after mania, gimmick after gimmick, from one consumer exploitation to another, until they all resemble each other in a dreadful mish-mash! Ferrante, who is a refined poet, naturally doesn’t let himself be drawn by his same intentions into a massacring condemnation of sociological criticism: rather he limits himself to tracing and sketching intentions, abandoning them immediately and letting them, quite rightly, fall into the cauldron of the reader’s reflections; his poetry having reached the furthest point of the emotive flow that he wanted to create disperses the sounds and, in dissolving, finishes. A polemical intention, then, is never shown and probably doesn’t even exist in that, unfortunately, the awareness of the uselessness of such a critical operation is present in the poet. What remains is rather the instrumental, objective data, a historical vision, the main records of a certain time and life-style which probably we are all aware of and so are not used to defining its most appalling features. It’s as if the numerous homeless persons in Metropolis wanted to remind us precisely of that; the visual force of some verses has the pictorial manner of a rendering on a canvas by fits and starts, by violent slashes of colour. It’s like that for the many tramps, the cripples, the reference to “incidents at work” – a term loved by the newspapers and that has entered our collective lexicon with the same peace and calm with which we say the word “biscuits” or a “digital decoder”. These things emerge and flower from humanity’s unconscious and form a sort of intermezzo from time to time present inside the gallery of images perfectly completed and ordered in the literature dealing with the metropolis. 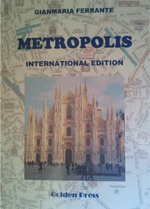 As regards lexis, that chosen by Ferrante is without doubt allusive and occasionally even mocking: “enormous numbers / fall / from the financial horizons”: the stock exchange, the Press and the banks almost become new schemes for modern games of Tarot, while other fixed points of the real medieval world show themselves as unchangeable: the Duomo cathedral and Death. The chosen ways of attempting to oppose these produce only pity or tenderness but the poet doesn’t shy away from using a fierce irony: in his verses the orange-coloured “false monks” are seen as ridiculous, making fun of the alternative – that doesn’t appear consistent – to today’s feudal obtuseness. There are cats and sacks of rubbish, cold and frost, and also moving mechanical monsters, fully anthropomorphic and frightening; there is even a religious procession, the remnants of a triumphal Middle Ages, that becomes a violent, menacing roar. At times the city is recognisable as Milan but its conceptual expansion to any other urban conglomerate of our time is clear. In the section “Fragments of the past” which follows the movement, in rhythm and content, of the preceding “Still you”, the references to a parallel history released by the images are shadowy and symbolic and so less immediate. The role of the wandering knight of the medieval epic peeps out as a faint glow of a resplendent humanity and is attributed as a sad but delicate homage to a young madman. Images flourish of lost companions, flickering occasionally in the sordid, metallic turmoil in which all feeling is absent, and these trace the lines of the present like bitter slashes of a pencil line repeated with different lengths but infinitely. The final section, like the poetry that finishes the story of the collection, gives its voice to the singer’s telling prayer. The classical epic would have dictated the need to insert it as the invocation in the prologue but here we are in the ‘Middle Ages’, so even that placing is perfectly in keeping with the times.